Who started first and how did you start with Upside Motion? Pat: Have you always done Barre? Reanne: Yeah, I did barre with the very first Barre instructors of Upside Motion! Pat: Wow that's long, and you had it tough! What about the others? Jiaxin: I started in late 2015. Glendah: I think I started first of November last year then Hui Yi came a month after me. Esther: Hmmm, September last year - 2017. Did all of you start with Barre? All of the ladies started with Barre individually and got together there. People always assume they were friends before and outside of Upside Motion because they really hit it off, but they really just met at the Barre! Hui Yi: I think most of us started in Barre, and that's how we met each other. Pat: Yess.... so you girls got together in Barre? How did you girls get together? Reanne: I got to know Hui Yi first too and Glendah got jealous (laughs), so she kind of hooked us up. And she also (talking to Jiaxin) kind of hooked us up. And Esther just popped up! Esther: I popped up because of the photo Tabitha asked you to take of us. Esther: Instructor Jabi also asked that! Glendah: And we always tell them no, we met at Barre! What is it like having each other around in class? It's a team effort now that they're working out together. Everyone pushed through strong together. Esther: Oh like just now? Tabitha: Yeah, you didn't draw the weights down at all! Tabitha has played a big part in bringing you guys together right? Tabitha is instrumental in bringing all of them together. Esther: I was going to say, we all got together because of Tabitha's class -- the misery she puts us through! How has the work-out changed since then? The struggle is more real now because there is a greater form of accountability from Tabitha, also now that their forms are on point and that she pushes them harder and have to level up by giving more energy too. The girls are just amazed and can't stop watching at how far they've come along together. When they see first-timers in class, they are reminded of how it was when they started and it validates their progress too. Reanne: I think the work-out became more fun! Esther: People are all struggling! Jiaxin: But at the same time, it looks lovely when you see each other synchronising! Hui Yi: We were talking about how we can't stop watching because.. how possible is that? Jiaxin: We were all in sync! Glendah: We should've taken a video from when we first started right? Hui Yi: When I see the first timers, I would think, that was me! I was there once! Jiaxin: I think we've gotten stronger--a lot, a lot stronger! Esther: and she's like: "Give me some energy!" and I'm like, no, there's no more energy! 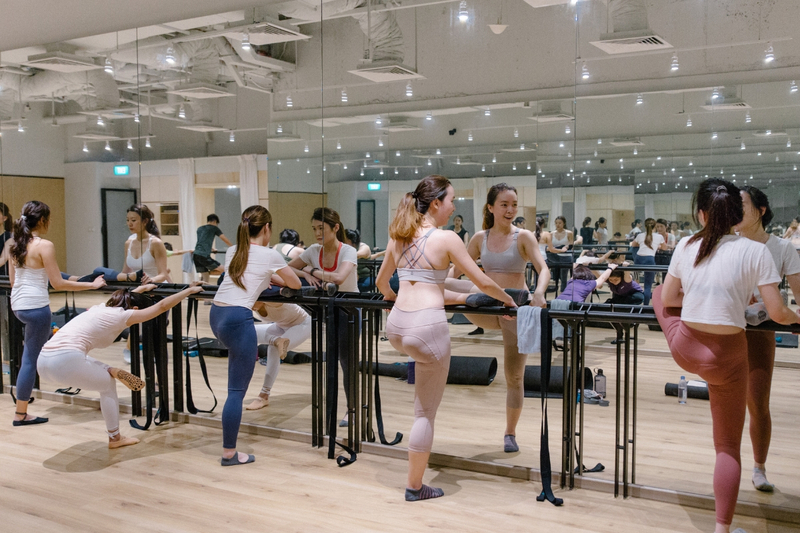 Are there Barre movements you love doing together? They all agreed that there are movements they DON'T like doing like the tricep dips. Although they are hating inside, it also motivates them to try as hard. Hui Yi: maybe more of what we don't like! (laughs!) I hate tricep dips, and then today, one of the girls went to do the cross-legged variation and I had to do it! We never do that! Glendah: But it's also how we motivate each other. Tabitha: Yeah because if you see someone can do it, then maybe you can try to do it too..
Is there anything you want to say, watching this group grow, Tabitha? Tabitha feels like a mother hen for the ladies watching them blossom and grow. Tabitha: I really see the change in all of you! From the first time I've done Barre with you guys---and now everyone's so strong. I think the form is super on point, and that---if there's one thing that you keep doing---then you're gonna keep getting stronger and stronger. Never ever forego form---that's your superpower. Actually, when I see you guys push through, it really makes me more motivated! As in I must do too! I cannot show that I'm tired! Tabitha: Sometimes, I do, I feel like, oh my gosh, my glutes and my arms are burning and these guys are going to feel it tomorrow! Hui Yi: Tomorrow? I think I'm gonna feel it later! Tabitha: Before shower right? That's the worst time! But yay, well done! Girls: Yay! I'm so happy to have you all in class! 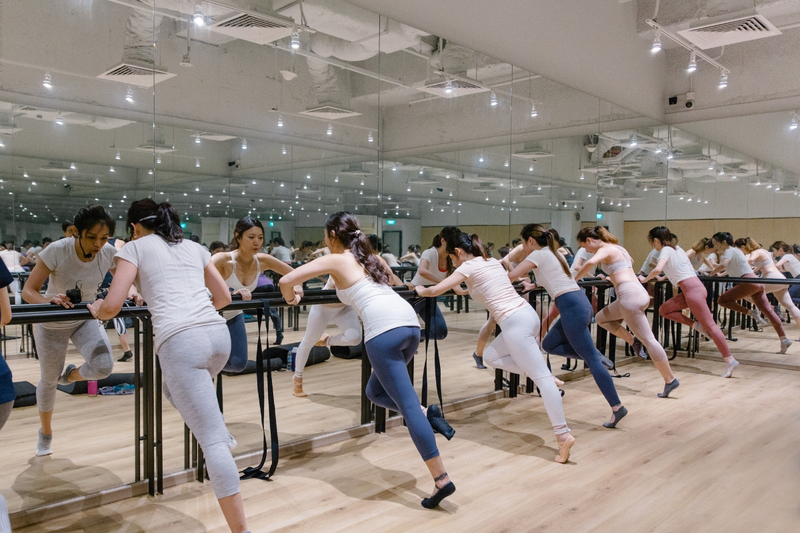 What is your advice for those who are just starting out with Barre? -Don't be afraid to die! You'll die gracefully! -Find the right people to go with. They're all lucky to have found each other. -Don’t be afraid to make friends, smile, and compliment on each other’s barre outfits! These simple and small things that connected them make the Barre classes worth their while. Glendah: Die gracefully-- yeah! And just have fun! I think we are strong, but we're the soft kind of strong #softbutstrong--so cheesy lah! Reanne: Actually, I started with a group of friends then they all left. Patricia: Oh, but you got your group back! Reanne: They left 'cause they don't find the motivation to come to class. Like, once they get tired, they're like: I don't want to do it anymore! They feel lazy so they stopped coming. So I'm happy with my Barre friends now 'cause they will never say no! Hui Yi: A lot of people are like "You still go to the gym after work, are you crazy?" Jiaxin: Knowing that there are friends with you to push you makes me look forward to coming to class. Reanne: Actually, we come for the teachers too! Teachers play a big part! Jiaxin: I think Barre classes are like dancing. You don't just work-out, you goes up and down with the beat. After a crazy day at work, it's fun! Glendah: Just have fun, find friends! Don't be afraid to smile ---that's how we started right? Glendah: That's why it ended up that we all had the same tights! Tabby, is there anything you wanna add? Tabby's advice is to not worry about the things you can not do. Don’t let any past fitness or dance experience discourage you. Esther started out with an injury and was also advised not to take ballet classes because her teacher said "she wasn't graceful enough". She still wanted to be able to find ballet-inspired classes that were also fun. She found herself the perfect combination in Barre where she was guided to get stronger. A great big plus are the friends that she met, who will be growing, pushing through and getting stronger together with her. Tabitha: I guess, just come into class. Don't worry if you're not flexible or strong enough, that's why you're here in the first place, right? And just have fun! Be open and get strong together. Esther: I remembered my first class with Tabby, I was injured. I was telling her that I was doing ballet as well but my ballet teacher said I was not very graceful. Tabitha: But look at you, you're so graceful now! Esther: Then I was still doing ballet but at the same time, I wanted to find other class: like ballet but more fun, so this is a good mix! I felt so unmotivated 'cause I couldn't move my ankle then I slowly tried my best. Thanks so much ladies! It's so wonderful to feature you!